Participate in the power rituals on the 1st Saturday of Purattasi. On this day, the Moon will be in the sign Scorpio and in the star Anuradha. Anuradha is the birth star of Goddess Lakshmi and worshipping Vishnu on this day will propitiate Goddess Lakshmi. An archana will be performed at the Vishnu Powerspot and the Lakshmi Narayana group Fire Ritual will be performed at the AstroVed fire lab and remedy center in Chennai on Sept 19th (IST). 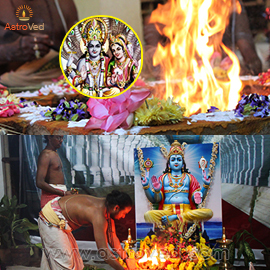 Lord Vishnu and his consort Lakshmi are the chief deities of this powerful Homa. Performing Lakshmi Narayana Homa blesses you with material wealth in abundance. While the Goddess of wealth grants you with boons of prosperity, material abundance, good luck, harmony and spiritual prosperity; Lord Narayana will protect your riches and saves you from unforeseen financial obstacles! Participate in the power rituals on the 2nd Saturday of Purattasi. On this day, the Moon will be in the sign Aquarius and it will be receiving the aspect of Jupiter, which is very auspicious. This will bring in all sorts of benefits and gains because the sign Aquarius is the 11th sign of natural zodiac. An archana will be performed at the Vishnu Powerspot and the Sudarshana group Fire Ritual will be performed at the AstroVed fire lab and remedy center in Chennai on Sept 26th (IST). Participate in the power rituals on the 3rd Saturday of Purattasi. On this day, the Moon will be in the sign Taurus. In this sign, the Moon will be exalted and aspected by Saturn. This is a good day to remove the Punarphoo dosha. Punarphoo dosha means the affliction that delays everything. An archana will be performed at the Vishnu Powerspot and the Lakshmi Hayagriva group Fire Ritual will be performed at the AstroVed fire lab and remedy center in Chennai on Oct 3rd (IST). Hayagriva, the God of knowledge and wisdom, is a horse-headed avatar of Lord Vishnu. His blessings are sought before beginning the study of sacred and secular subjects. Offering prayers to Lakshmi Hayagriva will help to enhance your knowledge, wisdom etc and also help to increase your finances. Legal disputes, issues or obstacles may also be nullified with the blessings of Hayagriva. Participate in the power rituals on the 4th Saturday of Purattasi. On this day, the Moon will be in the sign Leo along with Jupiter and will provide good energy to have more opportunities in life to make progress. An archana will be performed at the Vishnu Powerspot and the Dhanvantri group Fire Ritual will be performed at the AstroVed fire lab and remedy center in Chennai on Oct 10th(IST). 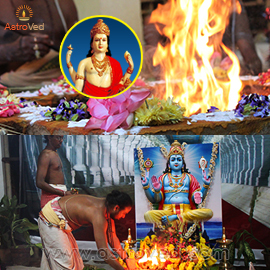 Lord Dhanvantri is the chief deity of this powerful Homa. He is the Divine Physician who is an incarnation of Vishnu. Dhanvantri Homa will imbue you with positive vibrations and shield you against health disorders. This powerful Homa will be a remedy to all your illnesses. Participate in the power rituals on the 5th Saturday of Purattasi. On this day, the Moon will be in the sign Scorpio in the star Jyeshta. This star ruler is Mercury whose overlord is Lord Vishnu himself. An archana will be performed at the Vishnu Powerspot and the Lakshmi Narasimha group Fire Ritual will be performed at the AstroVed fire lab and remedy center in Chennai on Oct 17th(IST). Offer your prayers to Lakshmi Narasimha on the last Saturday of Purattasi. The universal preserver or maintainer, Lord Vishnu, took the form of Narasimha, the Man-Lion, to save the world from demons, negative energy and ill effects. Goddess Lakshmi is an embodiment of wealth and prosperity. Their blessings will help you lead a successful life. The easiest way to access God’s grace is to feed a person who is starving for food and to donate clothes. Donating food is considered to be the greatest charity of all the charities. When you donate food and clothing to those in need, it elevates your soul. It helps to unburden you of karma and helps to clean the subtle bodies. 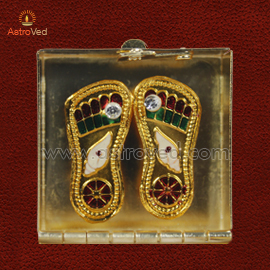 The Sandals of the Vishnu are considered a very sacred object. We are having this symbolic representation fully energized and infused with powerful rituals on Purattasi Saturdays. The Feet supports the whole body. The nerves that come from the Crown Chakra reach right down to the feet and the vibrations of the inner self constantly flow out through the feet. More Shakti flows from the feet than any other body part. Offer your prayers to the energized Vishnu Sandals. The elevation view of his sandals in sleeping posture is the Tirunamam. His Sandals will bring in the blessings of Hanuman, Adishesha, Goddess Lakshmi and all Devas. Prosperity will knock the doors. There are 5 Super Saturdays are called Purattasi. They are celebrated every year because they have a strong connection to Lord Vishnu. Astrologically, each of the 5 Saturdays are unique, yet they all share a special power that is particularly effective in minimizing the negative effects from Saturn. This year Purattasi Saturdays are significant because the Moon will be in “fixed” Zodiac signs during each Saturday. This will create stability in all areas of life. You can attain dependable: career, health, wealth, and relationships with the blessings of Lord Vishnu. September 19th – Moon in Scorpio and the star Anuradha. Anuradha is the birth star of Goddess Lakshmi. Worshipping Lord Vishnu on this day will propitiate Goddess Lakshmi. September 26th – Moon in Aquarius. The Moon will be receiving a very auspicious aspect from Jupiter in Leo. This will bring in all sorts of benefits and gains because Aquarius is the 11th sign of profits and gains of the natural Zodiac. October 3rd – Moon in Taurus. Moon is exalted here and will be aspected by Saturn. It is possible on this day to remove the Punarphoo dosha through rituals. Punarphoo dosha means an affliction that delays everything. October 10th – Moon in Leo along with Jupiter. This day has good energy to bring more opportunities in life to blossom and grow in any area of life. October 17th – Moon in Scorpio and the star Jyeshta. Jyestha is ruled by Mercury whose overlord is Lord Vishnu himself. Maha Vishnu is the protector of this Universe. When you propitiate Vishnu, you will be gifted with long life, peace, prosperity and happiness.